Surface textures and types of dirt vary throughout a facility, so choosing the correct broom and brush construction is important for maximum cleaning effectiveness. 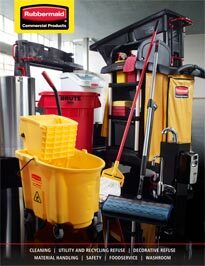 Rubbermaid brooms and brushes offer a complete range of blocks and fill types to clean virtually any surface. Staggered hole pattern prevents gaps in fill material for better performance. Dense fill leads to longer brush life. Flagged tips pick up fine dust and dirt particles. Flared ends allow access to corners. Soft to medium stiff fiber from the Agave plant. Durable and retains shape after continual use. High resistance to heat, alkali, solvents, and acid. Can be used wet or dry. Very durable with excellent abrasion resistance, shear/break strength, and bristle bend recovery. Will not stain, discolor, or absorb odors. Can be used wet or dry and is resistant to alkalis and most solvents. Extremely durable. Excellent bristle bend recovery and shear/break strength. Resistant to water, oils, and solvents. Not for sweeping compounds or oily surfaces. Very durable with good abrasion resistance and shear/break strength. Will not stain, discolor, or absorb odors. Resistant to solvents, acids, oils, fungus, and bacteria growth. Can be used wet or dry. Provides a high degree of abrasion without severely scratching hard surfaces. Will not rust. Best for heavy cleaning of metal or brick surfaces that cannot sustain heavy scratches. Provides a high degree of abrasion and wear resistance. Resists chemicals and rust. Excellent bend recovery. Best for aggressively removing residue from metal or other resilient materials. Provides a high degree of abrasion and wear resistance. Good bend recovery. Best for aggressively removing residue from metal parts or brick work.